For dog people, part of the fun of participating in social media is engaging in real relationships with other dog people, even if you’re thousands of miles apart. We cry for dog friends who have gone to the Rainbow Bridge, even if we’ve never met them. We rejoice when one of our cyberfriends adopts a new pooch. And we worry (and post like crazy) when a friend’s dog becomes lost. Dropping the “media” and just getting “social” is also a big part of the fun — as in, meeting in person. (Yes, people still do that.) And dogs love it. After all, dog butts aren’t satisfying to sniff through a computer screen. Involve yourself in an online charity endeavor — Look for a group that does something you believe in — saving homeless Schnauzers or raising money for spay and neuter — and share their posts. Engage with other members of the group by posting on their threads and tagging individuals you’d like to know better. Find a breed-specific group or community — Do you love American Bulldogs or Irish Setters? Whatever your breed, there’s a community for you in the social media cybersphere. You will instantly have something in common with other group members. Start an account for your dog — Dogster.com, Instagram, Twitter, and other sites allow you to start an account for your dog. You can post as if your dog is doing the posting. It’s a great way to make other dog friends because it’s easier to get people to follow or friend a dog than a human. After all, who’s more trustworthy than a dog? Post consistently — Share photos of your dogs and stories of your joys, heartaches, worries, and triumphs. Part of the draw of social media for dog lovers is knowing that you aren’t alone in your experiences. Be generous — Like and comment on other people’s posts. When someone comments on your post, thank them, like their reply, or reply back. Tag people in your posts if you’d like them to see it — this also helps them get noticed by your own followers. Through a charity campaign that I ran on social media for several years, I met Carol and Thayne of Grey Muzzle Rescue and stayed overnight with them and their 13 dogs in Orcas Island, Washington, 3,000 miles from my home on the east coast. Through the same campaign, I met “Puggle Mom and Dad,” Cheryl and Larry from Illinois and had dinner with them in Chicago and Orlando. I’ve visited Deborah and her agility champion dogs in Los Angeles twice, where we ate Mexican food and took our dogs to Long Beach for a romp in the sand, and I’ve seen Deb in my hometown as well. Just today, I went to my friend Tracey’s home for a doggie play date. I met Tracey on Facebook simply because our dogs looked so much alike, and we began messaging back and forth about their similarity. Now we talk on the phone nearly every day, even though both of our dogs have passed on. Social media has opened up my dog world. Step out from behind the screen now and then, and reach out to your social media pals. You might find a real friend — one that loves dogs as much as you do. BOL: Barking Out Loud! Like LOL, but you know … dog. OMD: Oh My Dog! Like OMG, but … dog. Woof Wednesday: Use the tag #WoofWednesday and share a great photo or cute story. 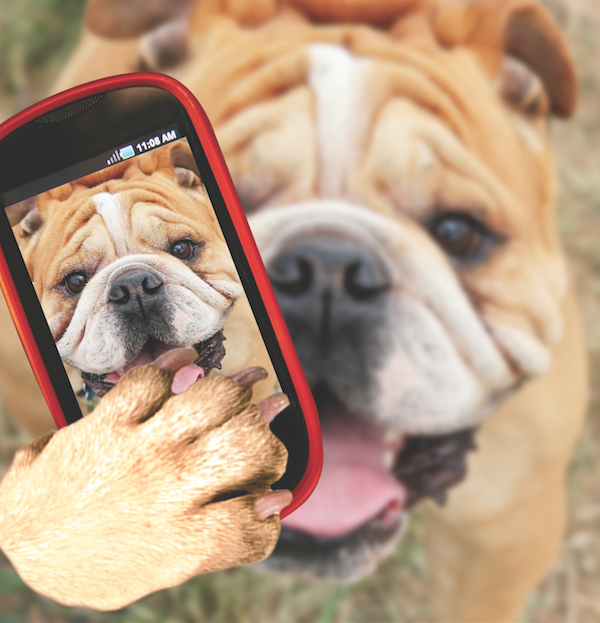 Selfie Sunday: Share a photo of you and your dog taking a selfie on Sunday using the tag #SelfieSunday. To explain the hashtag phenomenon simply, a hashtag (#) is a way to aggregate information and posts on certain topics by key word. For example, if you use #dog on Facebook, Twitter, Instagram, and other social media sites, and then you click or search on #dog, you will find posts by everyone who has used the key word #dog. If you use hashtags, you’re more likely to find new followers and friends. For example, I love Poodles, so I search #poodle often on Instagram so I can see photos of cute poodles and find other poodle lovers to follow. When I follow them, they’re likely to follow me back. Eye contact for static shots. A sitting or resting dog who’s gazing into the camera or phone lens is far more likely to engage followers than one who’s looking away. The exceptions are arty photos or videos of a dog gazing at a sunset, an ice cream cone or pizza slice, or at his human friend. Try action shots for maximum engagement. People love seeing dogs in their element, running in a park, on a beach, or in the snow, playing with other dogs, or doing cute tricks. Catch dogs outside of their element. Dogs dressed in costumes or clothes, dogs with wigs and mustaches, and dogs in Darth Vader helmets are all crowd pleasers. Naughty dogs = #awesome. If you can catch your dog in the act or film the aftermath of a naughty (but not dangerous) episode, you’ve hit social media gold. The post How to Make Dog Friends Through Social Media appeared first on Dogster.